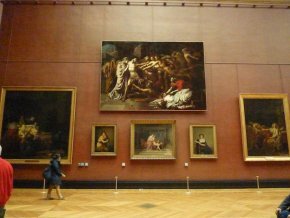 13/11/10 – Hang – Paris, Musée du Louvre – Temporary exhibitions and the ensuing location changes for works often enable the Louvre’s curators to take paintings which have not been seen for many years out of storage. Thanks to the exhibition on Neoclassicism which will open on 2 December , visitors will now be able to discover one of the most ambitious canvases of the Revolutionary period, Orestes’ Remorse by Philippe-Auguste Hennequin (ill. 1), which had not been displayed, unless we are mistaken, for over twenty years since the exhibition on the French Revolution at the Grand Palais for which it had been restored at the time. This mythological scene, painted in 1800, is also an allegory, in which Orestes represents “the revolutionary spirit persecuted by the victorious counter-revolution ”. It now hangs in the Daru room (ill. 2) across from The Apell School by Jean Broc (see news item, in French, of 30/1/07 in French). Unfortunately, the few works which are displayed temporarily, and which we systematically attempt to point out to our readers, sometimes return just as quickly back into storage, when in fact there is plenty of room higher up on the walls. 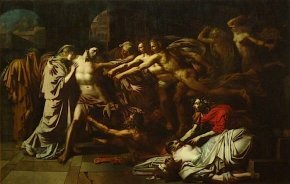 For example, Joseph’s Bloody Tunic Is Taken to Jacob by François-Joseph Heim (see news item, in French, of 6/7/10) was not displayed for very long and The Allegory of the French State by Jean-Pierre Franque, exhibited for a long period (see news item of 4/3/06 in French) has apparently disappeared (unless it turns up in the exhibition). Even more regrettable : the marvelous Vision of Saint Jerome by Orazio Borgianni, replaced with the Cavaliere d’Arpino painting which was recovered from the Senate (see news item of 1/3/10) has still not been hung again although Vincent Pomarède, chief curator for the Département des Peintures, assured us several months ago that it would soon return. L’Antiquité rêvée – Innovations et resistances au XVIII siècle. See the catalogue for the exhibition La Révolution Française et l’Europe 1789-1799, pp. 638-639. The painting was reproduced in black and white only, before its restoration.